Since it's a balmy bazillion degrees outside, I thought it would be a good idea to make a cold soup. Since I had on hand a couple large potatoes in relatively good shape, I figured why not transform them into vichyssoise. Cold potato soup sounds like someone ladled out the previous night's leftovers without bothering to first reheat it because it was a bazillion degrees outside ... probably while standing in front of an open fridge to enjoy a brief cold blast. 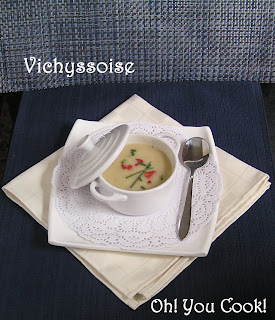 But when called by its French name, Vichyssoise (pronounced vih-shee-SWAHZ) sounds chic, exotic and complicated to prepare. Have you been to a potluck where one of the items is (are?) deviled eggs? And everyone comments about "those deviled eggs again" and "how unhealthy" and "how ordinary" and "I'd never eat that"? 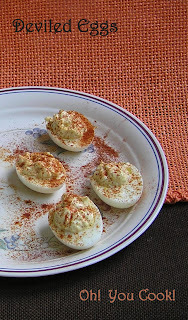 Did you also notice that the deviled eggs were the first item to disappear? Well, here's a recipe that will disappear so fast the eggs might not even make it out your door. TIP ALERT! "They" say to use older eggs to make the peeling more appealing. "They" is right. I had the luxury and misfortune to have newish eggs on hand. Some of the shells fought me all the way, resulting in a few eggs of less than perfect ovals, but shape doesn't affect the flavor any. But with careful cropping and artful arranging you can barely tell that chunks of white are torn or missing.